Connecticut » Blog » Fire Damage Repair » Dare to Be Bold Day – Taking calculated Risks – How to safely construct a fire pit. Dare to Be Bold Day – Taking calculated Risks – How to safely construct a fire pit. Many homeowner’s are looking to upgrade their property, but are unsure of the risk versus reward factor. If you set out to upgrade your home into the amenity-filled property you’ve always wanted, what are the steps for doing so? Can you do it on your own? What happens if it doesn’t come out just right? With so much money at stake, these are all valuable questions. 911 Restoration addresses these answers and more in order to put you at ease when making a major building decision, whether it’s a simple fire pit or a whole home remodel. Perhaps one of the simplest additions to a home is reworking the exterior, such as planting a garden, erecting a fence, or adding a fire pit. The very nature of the fire pit is dangerous. Having a fire roaring in close proximity of your property is a liability, but done right, it can add a pleasant warmth in cool autumn nights and a great place for campfire stories if your family is one that prefers a night amongst the stars. 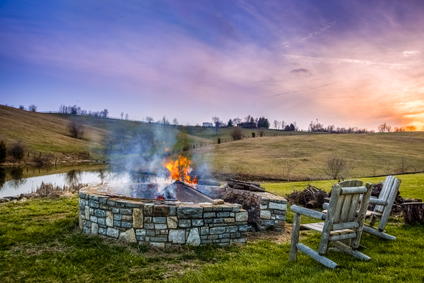 To build a fire pit, you may want to consult with an expert contractor or other home building professional whom can deem appropriate distances and materials to use in your specific situation as each community is different in how far away a fire should be from a home. Once you have chosen the perfect spot away from your building, outline the area with spray paint and start digging. If you have a natural slope in your property, use this to keep the fire lower than any foliage. The pit needs to be on a flat surface and you want to dig out a pit big enough not only for a fire, but a seating area around it. Afterwards, scoop out a smaller diameter hole and surround it with rocks and add a brick basin. This is where your fire will reside. Keep any flammable materials inside this pit and never let it burn over night or higher than what you can control. Any time you play with fire, there is a risk of getting burned. With measures in places to prevent such an occurrence, such as all the sand that you dug up nearby to quell the flames, keeping the fire below any grass or hedges, and constructing a fire-proof bowl to keep the heat in will all mitigate the chances of a real disaster occurring. For a simple, step-by-step process on building your own fire pit, complete with instructions on using mortar and concrete, check out DIY Network. 911 Restoration is proud to be working with all insurance companies, and in many cases, we are able to not only restore homes, but make them better. When you need our aid with water, fire, or mold damage, don’t forget to ask how we can add to your house.